It is vital to notice that arc fault circuit interrupters could mitigate the results of arcing faults, however, cannot eliminate them. In some cases, the initial arc could cause ignition before the detection gate interruption by the AFCI. 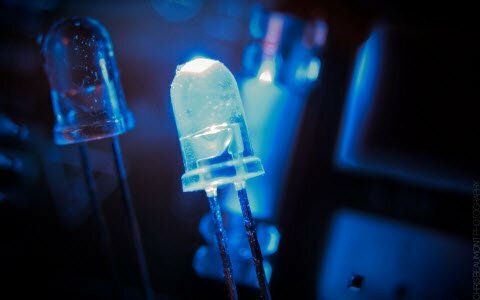 Theoretically, an arc is defined as a Continuous illumination discharge of electricity across an insulating medium, usually supplemented by the partial volatilization of the electrodes. An AFCIs are designed into conventional circuit breakers combining traditional overload and short-circuit protect with arc fault protection. The AFCI circuit interrupters provide protection for branch circuit wiring and limited protection for power cords and extension cords. 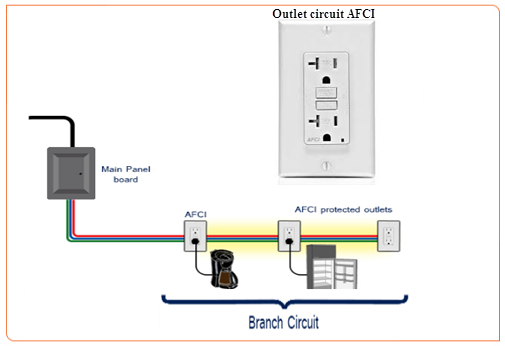 The AFCI circuit breakers have a test button and look similar to GFCI circuit breakers shown in below figure. Generally, AFCIs require monthly testing to notify the user that the AFCI is functioning properly. There are several probable reasons an arc fault may occur, as given below. Improper installation or stabbing of a wire with a screw, nail during installation or maintenance of the electrical system. Damaging of extension or appliance cords by vacuum cleaners, door furniture or an appliance has been positioned on the cord. The advanced age of extension or appliance cords, or even wiring in the walls, which can over time experience worn or cracked insulation. Loose connections in outlets, switches, and light fixtures. 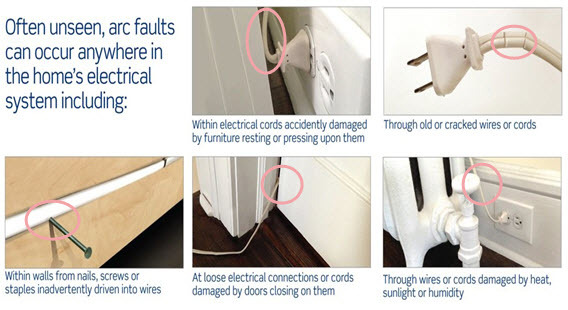 Appliance cords damaged by heat, kinking, impact or over-extension, spillage of liquid. Any of the above circumstances, which we discussed above can result in a parallel or series arc. 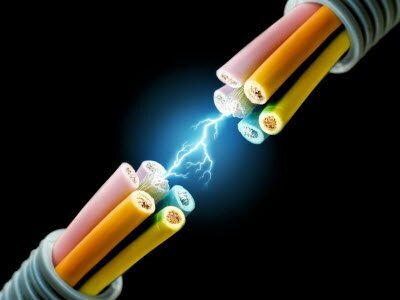 The parallel arc fault arises, when the current flows through damaged insulation from one conductor to another conductor, producing a short circuit that is too weak to be detected by the circuit breaker. 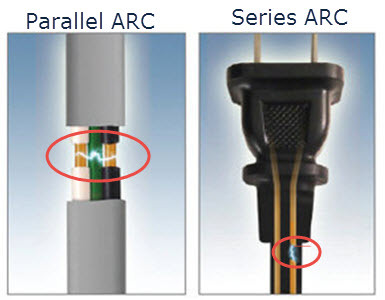 A Series arc fault arises, when a single wire damaged and cannot tolerate the current, causing the current to arc from the conductor into the insulation. This leakage current can burn and eventually burn the insulation. The AFCI circuitry always monitors the current flow through the AFCI. The Arc-Fault Circuit Interrupters use detection circuitry to discriminate between normal and unwanted arcing conditions. Once an unwanted arcing condition is detected, the control circuitry in the AFCI trips the internal contacts, thus de-energizing the circuit and reducing the potential for a fire to occur. The arcs produce a current signature or waveform. The faulty arc can produce a non-periodic waveform. Various methods for the detection of fault arcs include looking at certain frequencies, discontinuities, and variations in the current waveform. For detection, both magnitude and time period of a particular half cycle are required. An Arc-Fault Circuit Interrupter should not trip during regular current conditions. 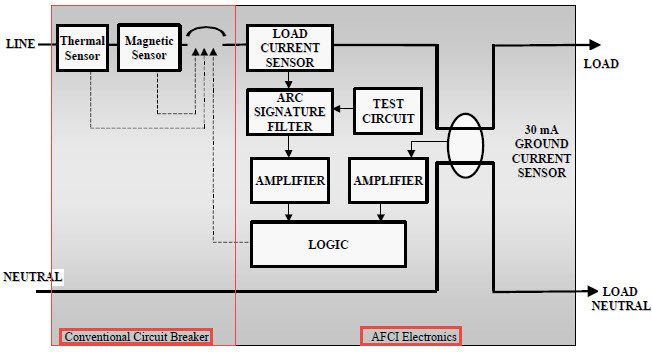 The below illustration is a block diagram of a single pole AFCI circuit breaker. The AFCI electronics can function independently from the conventional circuit breaker. The conventional circuit breaker has thermal and instantaneous sensing functionality. Using a load current sensor, the AFCI electronics detect the current flow from the load terminals. The load current sensor can be either a resistive or a magnetic sensor. The load current sensor’s output is fed into an arc signature filter that passes frequency components of arcing waveforms while rejecting other power line frequencies. The arc signature filter output is amplified and fed into a logic circuit that determines that any unsafe condition exists in the current flow. As discussed before, both amplitude and time period are used to detect the unwanted arcing condition. If the logic determines that the load must be deactivated, a signal is fed to a TRIAC used to energize a solenoid that opens the circuit breaker contacts. 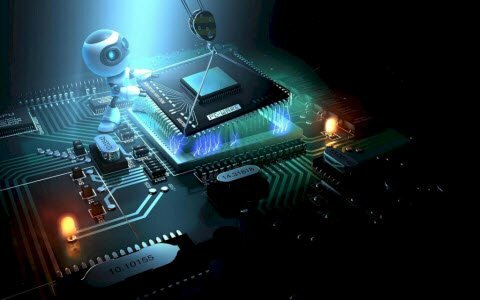 A test circuit is provided to ensure that the arc fault detection circuit is functioning properly or not. 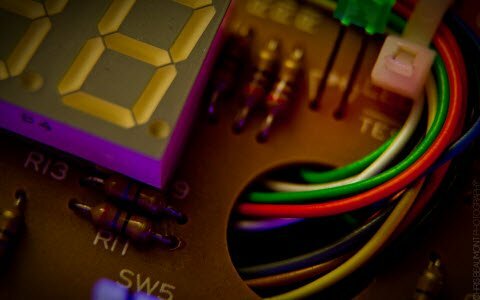 A test button functionality is used to generate a signal that is similar to an arcing output waveform of the load current sensor. 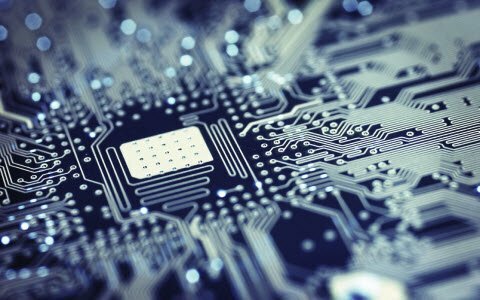 The test button will deactivate the circuit if the device is functioning properly. Here different types of AFCIs are available depends upon their viable applications. It is intended to provide protection to branch circuit wiring, power supply cords, and cord sets connected to it against the unwanted effects of arcing. These are installed at the origin of the feeder or branch circuit. It is intended to provide protection to the feeder or branch wiring. The combination Arc-Fault Circuit Interrupter combines both the features of the OC and B/F. It is intended to provide protection to protect the appliance cords, extension cords, branch circuits and feeder wiring. 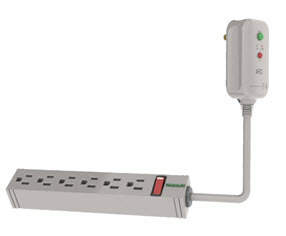 This is a plug-in device that is typically connected to the receptacle outlet and has one or more protected outlet. It is intended to provide protection to the connected extension cords and appliances. 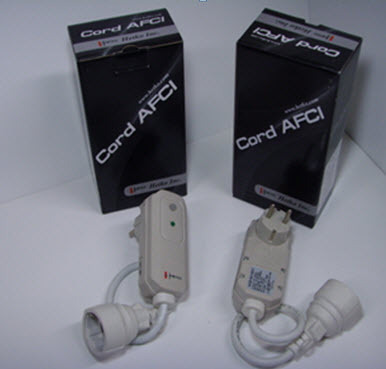 The cord AFCI is also a plug-in device that is connected to the receptacle outlet and often used to protect the connected power cord. 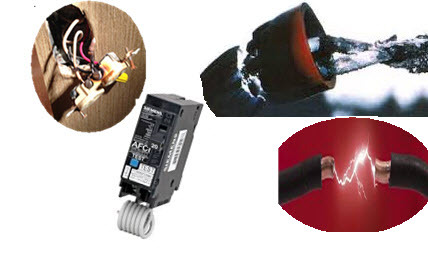 Thus, this is all about Arc-Fault Circuit Interrupters and its functions. We hope that you have got a better understanding of this concept. 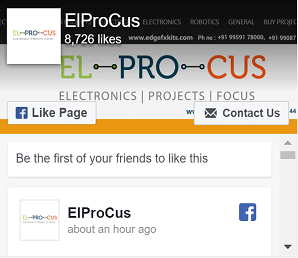 Furthermore, any doubts regarding this concept or to implement any electrical and electronics projects ideas, please give your feedback by commenting in the comment section below. Here is a question for you, What is the working principle of AFCI? I sincerely appreciate your kind response regarding my article, PLEASE SPECIFY YOUR EXACT QUERY.